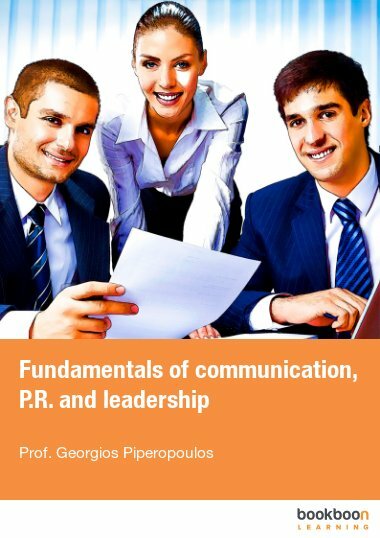 This book provides a refreshing introduction to the three fascinating and fundamental subjects of communication, public relations and leadership. This book provides a refreshing introduction to the three fascinating and fundamental subjects of communication, public relations and leadership. 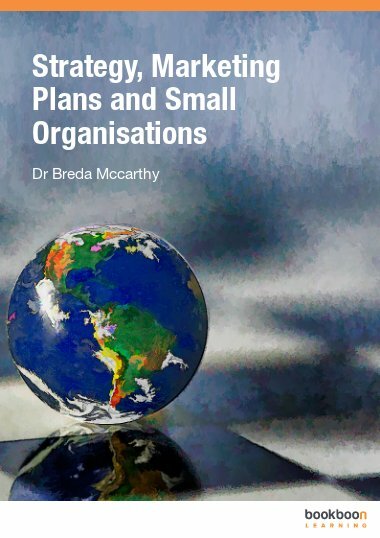 Aimed primarily at University undergraduate and postgraduate students (as well as those studying A-levels) in business schools, within the humanities and social sciences, and communication and media studies, the book examines and explores in a unique, provocative and iconoclastic manner the major theories, models and trends in the three fields. An admirably creative presentation of three interrelated subjects by a seasoned academic! Not just for university students but for working men and women who interact with the public and who are charged with management roles! Professor Piperopoulos presents three significant and related subjects in a distinguished monograph serving as an excellent textbook for students and a useful reference book for professionals. Read it and I am certain you will agree! Another notable example of the work of an academic who is obviously talented in bringing to an accessible vomprehension level academic material free of academic jargon. Three cruvialnthemes presented in a concise manner! With Parliamentary elections forthcoming in the EU I would strongly suggest to all candidates to download and read this book! Surely for all those interacting with the public as employees an managers of private otr public corporations, services, institutions and NGOs the book is definitely a "must read". An educational book by an author who knows his stuff. I have had extensive experience in the Sales field and yet as the book combines three important areas I confess that I learned some new things. Anyone who has an innate or an acquired talent of being an effective communicator has something to learn from this excellent book. All those who are not but wiush to be effective communicators have a lot to gain by treading this book. Professor Piperopoulos has made it possible! Informative, contemporary and useful in each of the three subject areas it deals with. Enlightening presentation of the challenging facets of human and animal communication. If, like me, you believe that 'communication is the name of the gsme' this book vindicates us. If you are not on our side please tread the book and you will convert. Professor Piperopoulos has done a great job! Professor Piperopoulos deserves recognition for his innovative paraphrasing -not plagiarizing- Descartes 'cogito ergo sum' as the subtitle to this impressive book 'I communicate therefore I exist'. An impressive introduction to the fascinating field of communication theory and media applications which is enriched with information on Public Relations. Professor Piperopoulos knows his stuff and with this book he provides the novices with contemporary and useful material and the more experienced with a first rate 'refresher'. Well done. For every professional interacting with members of the public a uniquely helpful book. A well structured, bibliographically rich trilogy which will be enjoyed by students in media, communication and PR management and by interested members of the general public. As the subtitle creatively suggests 'if you communicate you...exist! A remarkable treatment as an innovative triptych of the three interrelated and fascinating management subjects. A book worth reading! Great help for those who have not had exposure to PR and communication fields.Contemporary and fresh for those already involved in relating to people. Students, teachers, sales people and aspiring politicians will benefit from the first part of this impressive book. All those who interact with people will learn a lot from the Public Relations part of the book. Junior managers will learn from the Leadership section. There is something for almost every one who will download this book! A remarkable presentation of communication and public relations useful to everyone interacting with the public. The section on leadership is greatly enhancing this triptych of management topics. An impressive introduction to three significant topics authored by an academic/practitioner who knows his stuff. Useful for university students, enlightening for working men and women, informative for members of the interested public. Communication is 'the name of the game' in many aspects of commercial, entreptreneuriall, political as well as academic activities. Public Relations has existed through out history and is currently a professional activity. Leadership from antiquity tobour days shapes the realities in micro, medo and grandiose levels. Bringing the 3 subjects in one book professor Piperopoulos has been innovative as an academic practitioner! From the cover page where a woman instructs to the discussion on 'glass ceiling' professor Piperopoulos is offering a monograph enriching the existing bibliography on the 3 topics it covers. If you are in sales or need to interact with people do read it! An excellent treatment of three significant topics. I was especially impressed by the leadership section as I realize that Chancellor Merkel has been reelected since the book was published AND the :'glass ceiling phenomenon' for women managers has not been improved in the least! 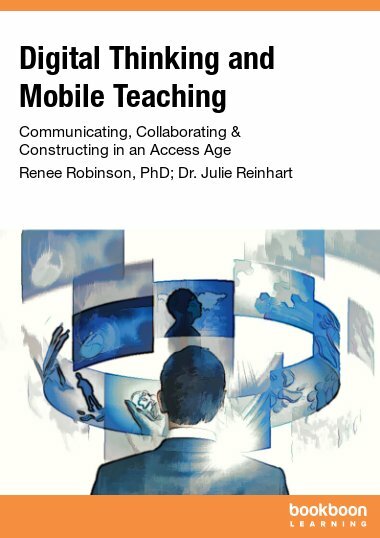 A remarkable textbook written by an academic who has had extensive practitioner experiences. Surely of great help to students but useful for those of us already earning a living in the services industry! An excellent textbook for novices, an uptodate refresher for professionals. I do applaud the author's presentation of the continuing glass to of problem facing professional women. Commendable! If, like me, you did not major in management or social sciences read this book. It is an excellent source as a textbook in the 3 areas contained in its title! An impressively innovative textbook on communication and public relations skillfully enriched by a third section on leadership. In sales and in other professional areas communication is "the name of the game" and this book can help you become a good player. It is enriched by good sections on public relations and management. Read it. Great help in enabling me to interact with the public. An excellent refetence book with an abundance of useful information. The section on PT helped me in my duties and the other two were informative as well. An excellent reference book for those of us who did not study social sciences or management but are currently in management positions. Well conceived, well structured, well authenticated an innovative in combining three significant fields. Well done! I think that the subtitle of the book "I communicate therefore I am" should be its title as it innovatively combines three interrelated subjects very well! Great book for those dealing with people as customers and as employees! It was recommended by a colleague and as an engineering graduate I learned a lot an applied what I learned in overseeing my current project personnel. Great help for media and communication students. 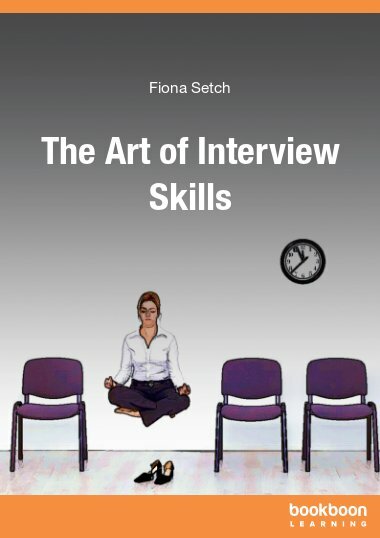 For a novice in public services a great valuable resource for dealing successfully with people! Impressive and informative, pleasant reading of three fascinating subjects! A really enlightening book for those of us who were exposed to communication and public trelations courses during outer university years. From the beginning to the epilogue this is a textbook worth the time to read. University students and young professionals have a lot to gain reading this modern textbook. It is never too late to download and read this textbook even if you have left the university amphitheaters a few years go and you are already in management. Impressive and convincing presentation of communication and public relations and useful treatment of management as leadership. The innovative combination and presentation of the topics of communication, pr and leadership render this excellent textbook as a 'classic' in its bibliographic category. An impressively innovative treatment of P.R. and communication useful to persons in management. Noteworthy presentation of communication, refreshing treatment of the specialty of Public Relations practical portrayal of leadership! A fascinating presentation of 3 subjects important in the daily routines of management in modern organizations. Impressive and useful for PR people! I wish I had seen this book during my university studies but I will say that it is not too late reading it now, as it is informative and useful. Informative and useful as well as challenging. Professor Piperopoulos has composed an innovative textbook covering three germane topics. Notable! Professor Piperopoulos has produced an impressive textbook useful to both students and practitioners. A modern book focusing on three modern and very significant areas useful for students, practitioners and for the general public! An excellent source of information and a high quality reference book for those of us in management dealing with the public we serve. A very well written and informative book for students and professionals in the communication and public relations fields. Thoroughly informative and well written. In our times communication is the 'name' public relations the means for 'leaders' to be successful. A book that will greatly help the reader understand the fascinating world of communication and gain insights in the operations and effects of public relations. An impressive and informative textbook familiarizing the reader with these three important subjects for all of us interfacing with other people. An easy to read, informative textbook worth downloading and keeping for future reference! I found it to be an informative and very useful book. It is an excellent ebook, you can gain a sound knowledge of communication P.R and leadership. I had the honour to talk with Mr.Piperopoulos and I am proud that we are both Greeks! I had the pleasure and honer of having professor Piperopoulos as my teacher and mentor at the University of Macedonia, Greece before coming to the UK for my post graduate degree in management. He was inspirational to me and many other students at the University and other Greek and European Universities. I am now extremely happy that i have found and downloaded this impressive book which should be read by undergraduate and professionals across the Globe. Helpful in learning to deal with the public and to understand those above and those below me in the organizational chart. An excellent source of information about PR and communication! An impressively useful textbook for all of us interacting with people on a daily basis. One of the best I have seen in discussing PR and leadership. What the world needs is charismatic leaders with solid ethical beliefs and good communication skills. Should be read by politicians and not only university students. An excellent textbook for those seeking to improve their communication and management skills! One of our apprentices recommended this book which really impressed me with its breadth of scope and fascinating contents. I enjoyed it thoroughly. Since my academic background was in engineering I did not have much exposure to the themes of communication and public relations. However in my current duties as plant manager I found these two themes and the third theme on leadership to be useful in my relationships with several hundred employees at my plant. A impressive textbook which I will keep as a valuable reference after graduation. An interesting and informative book. I enjoyed the reference to Brainwashing and propaganda as they relate to the Korean conflict of the 1950's and current Korean tensions. Great help for me as a sales person and I can imagine it is very useful for students in relevant fields. A very modern, very informative, useful textbook. If you were searching for good advice in improving your relationships with friends, clients or customers or, in good humor, your relationship with your cat or dog read this book! Professor Piperopoulos of Newcastle Business School Northumbria University has written an impressive book on communication, public relations and the subject of leadership. Read it and you will agree. A contemporary and informative book that delves meticulously but not boringly into the three areas of communication, pr and leadership. I enjoyed it! Professor Piperopoulos has created a unique text and innovated in covering 3 significant subject areas which are dynamically inter related. Well done! After reading it I will classify it in the category of most helpful textbooks for university students in media studies, marketing, management and PR as well as for young practitioners in these fields. A practical guide in dealing with clients, customers and interfacing with the general public. Download it, read it and I am certain you will agree with my appraisal of the book. The book was recommended to me by a friend at Athens University and I confess that I enjoyed reading it. Contemporary and informative. Contemporary, full of useful information, rich bibliography. As I am far removed from media, communication and management studies I thought this book would be hard to grasp and distant. I do confess that I found it interesting, informative, enjoyable reading and, finally useful. I found it to be an enlightening textbook useful for me and fellow students in media and management. A fascinating and commendable presentation of the three subjects. Well structured, properly authenticated, convincing arguments. An excellent textbook on three modern subjects. As I am in sales I found it useful as well as enjoyable reading. For those of us dealing with the public a great book! It would be helpful, and this is not to be taken as an insult, to some supervisors to read the leadership section and then look at their mirrors. Positive leadership at the end benefits all of us. I came across this book while searching material for theories of leadership. Great help and passed it on to a friend majoring in media studies. I found it interesting and especially provocative in its presentation of proper PR and of its extravagances. Very interesting handling of propaganda through time. Useful, full of info, a must read for all of us in service industries. Contemporary, informative, provocative and thought provoking textbook. I believe it could be used by students in many management, media and language degrees. A modern and impressive textbook not just for me but for fellow students in media and management. Enjoyed reading the stress/time book by Professor Piperopoulos and indeed appreciated this textbook for a fascinating presentation of the three subjects. Highly recommended by a friend from LSE and after reading it I will gladly recommend it to my classmates. Especially appreciated the rich bibliography. My lucky day to come across another interesting book by professor Piperopoulos. Useful and also interesting for sales people. If you are in sales or in other fields dealing with people and face to face interaction, download and read it. You will not only enjoy it but I dare guess you will pass the link on to associates and friends. 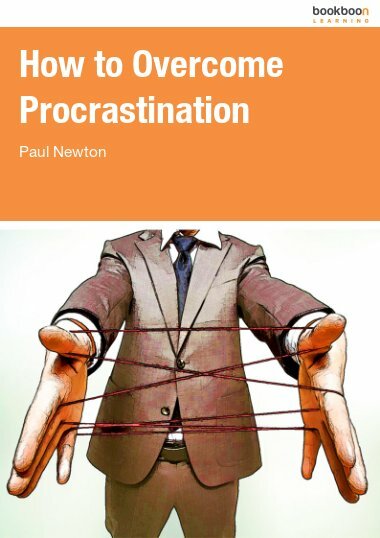 I evaluate it as mandatory reading for university students and a pleasant refresher for those of us professionally active. A useful and modern textbook for students and I think an interesting book for the general public. Very useful and informative for those of us away from social sciences. As I am in sales I enjoyed reading Professor Piperopoulos' book on stress and time management. I found this book informative in the first two parts, communication and public relations. Good read. Going beyond the university student audience, this book is a welcome refresher for seasoned managers. Informative, helpful, really useful for those of us involved in administration who do not come from the fields of business administration or communication. As I interface with the public I found this book indeed enlightening and useful. Lots and lots of information. Very helpful to those of us who have not had enough background in communication and public relations. Fresh approach to the eternal challenges of leadership. Richly informative and nicely rewarding reading. Educational for students, a refresher for us. Well conceived, well structured, well written. Surely useful as a textbook as we'll as a reference book. An eye opener especially on propaganda and brainwashing. 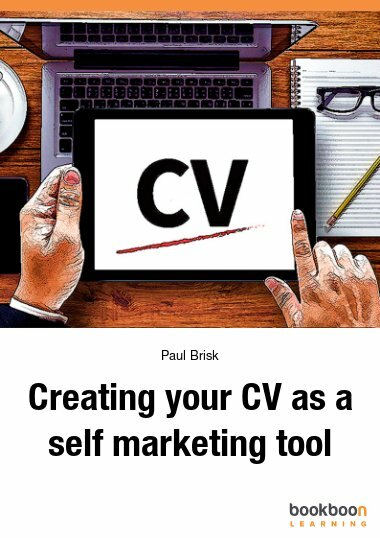 Surely useful to university students in management, media or marketing degrees but equally useful as a refresher to those of us already earning a living in these fields and in sales. After reading it I can see why this is an excellent textbook for university students. As a professional I found it to be interesting for me and I would gladly recommend it to anyone who may be attracted to it from its title. Rewarding download. Reading this book I am certain that it is a valuable textbook for undergraduate and postgraduate university students. It is equally useful to many of us already gainfully employed in sales and other special fields requiring face-to-face interaction. Read it! Well done! A textbook I will gladly recommend to associates, students an friends. As a newcomer to Bookboon I am delighted. Informative and refreshing approach to the three subject areas. Surely indispensable for management and media students. An excellent textbook useful not only to students but I would say to young professionals as well. A fascinating textbook which combines three crucial subject ateas in man agent and business administration. Easy to read, informative with the plus of an extensive very relevant bibliography. As a teacher I must be a good communicator and through experience strive to improve ceaselessly. I liked this book as I liked two other books by the same author. Easy to read, understandable, without the usual social/behavioral sciences jargon and free to download. Informative and useful for media and communication students and for young professionals in the PR field. The leadership section should provide plenty of food for thought to management students. The book was recommended to me by a fellow graduate student in my search for my dissertation bibliography. I was impressed and helped greatly. I now recommend it for its three major themes-components and for the impressive bibliography. Fascinating reading for non-social science students. For me, as an engineering grad, very useful in all three parts, communication, pr and management. A useful book for those of us who have to deal with employees of various backgrounds and customers from a variety of cultures. Easy to read, down to earth, informative. Preparing for a career in PR I have had a number of informative and useful textbooks as reading assignments. This book was not on my reference list but I came across it accidentally. It will sound silly or unorthodox but I will say 'wonderful accident'. Thank you Bookboon, thank you professor Piperopoulos. I downloaded it and enjoyed reading it. The book will introduce you to the fascinating subjects of communication (you might learn to read human faces as they 'talk' to you ) and management. The bibliography is impressive. Eureka! Lucky finding this book while searching sources for my MSc thesis. Rich bibliography and innovative combination of three smartly interrelated subjects. Download it! I found it to be a contemporary text useful to me as a business administration student. Informative, challenging and sometimes provocative. Thorough coverage of three related business topics. Enjoyable and informative reading. I wish I had come across this book while I was still a university student but, at any rate, it has plenty to offer to many of us in middle management. I enjoyed especially the sections on propaganda and the 'glass ceiling' phenomenon. Good reading. A really impressive handling of 3 interesting subjects easy to grasp by students and non-specialists laymen. A wealth of information available to readers. Reading time well invested! Contemporary, informative and useful book. A very interesting and commendable treatment of the old, ubeatable 'glass ceiling' for women managers in 'a man's world'. Competition is sometimes on a level demanding skills and knowledge which this book provides generously. I would recommend the book to students and young professionals! 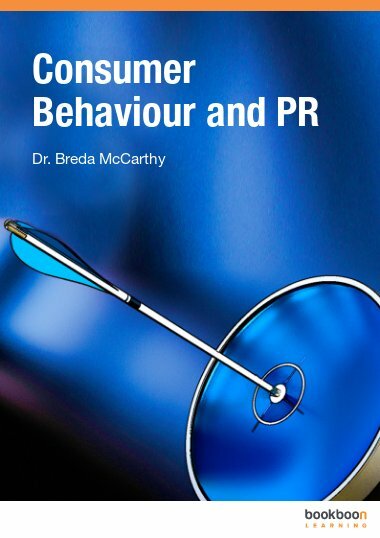 A well-written textbook on three modern and related subjects useful for business school students and apprentices in Public Relations and Management. A book that can be useful, beyond business school students, to engineering and other sciences students. I found it informative and pleasing. Fundamental but impressive introduction. The author has managed to render complex concepts to easily understandable pros. Excellent introduction to three contemporary subjects. Easy and understandable prose. Well structured intro to basic concepts in communication and management. Obviously useful to students in most fields and to young management trainees. A very interesting merger of 3 conceptual and practical topics and fields. Easy reading. Help and pleasant reading, useful for those less familiar with these concepts. In a world filled with media and gadgets enabling us to communicate, this book reminds us of the art of successful communication on a personal as well as on a corporate level. A must read not only for social science and business students but for those of us involved in the engineering and physical sciences. Uptodate and challenging approach to three related topics. Interesting section on the glass ceiling which hinders women to rise to top level posts. Presidential nominee Mrs Hillary Clinton has used the phrase "glass ceiling cracking... "
Having read previous author's books, it was not a surprise to recognize author’s concise, realistic and pinpointed way of writing. I found extremely successful the well-balanced academic language expressed in a direct and well comprehensive manner that keeps reader’s interest at a high pacing. Professor Piperopoulos as a communication expert, is known for his ability to formulate ideas into realistic, usable and constructive outputs and hence his paraphrased “I communicate therefore I am” intimates the significance of being able to communicate effectively as equal to “I think therefore I am”. Highly recommended for those who are looking for real life ways to improve or use their communication abilities. The book was able to meet my expectations as on what I wanted to read. The author was very precise as on how he presented these three various concepts which summed up to a high quality material. Very nicely written book explaining communication, Public Relations and Leadership. Highly recommended! It is worth reading it. Excellent!!!! Excellent work by Dr. Georgios Piperopoulos on the important subjects of communication, Public Relations and Leadership from ancient Greece to modern times. These are the fundamental skills that are needed by today's aspiring young entrepreneurs and tomorrow's leaders if they want to be competitive and successful in our modern, information overloaded societies and global markets.